Gives healthy people very good results in weight reduction. Perfect for children who wish to reduce their body weight; for pregnant women who want to improve dietary regulation and healthy eating. Recommended to all patients without health burdens, who in a simple and convenient way, want to lose unnecessary kilograms. It is used in dietary therapy supporting the treatment of insulin resistance, polycystic ovary syndrome, diabetes mellitus and bulimia, although with the case the full therapeutic effect is reached with the use of clinical nutrition and metabolic balance® plans. The benefits of regular dietetics are ease of use: meals can be prepared by the patient, with little time and culinary talent, as well as eating in recommended restaurants, which for people eating business lunch and dinners becomes a great convenience. The average weight loss rate varies from 0.5 to 1.2 kilograms per week, usually 0.8 to 1 kilogram per week, depending on the patient. This pace allows you to enjoy visible effects, but it also gives your shrinking skin, the ability to keep up with the weight loss process and becomes one of the factors protecting from the yo-yo effect. The downside of regular dietetics is the lack of a 100% individualized plan and a limited impact on the support of medical conditions. how is regular dietetics applied? The basic nutrition plan includes selection of products that the patients use to create meals on their own, depending on likes and tastes, products found in the fridge, what we can order in the restaurant. It is tailor-made to your needs and time. The first week is a diagnostic indicator. It allows us to get acquainted with the patient’s body. Next appointment, based on the body’s response, the patient’s weight loss rate and mood, we introduce individualized changes to the diet plan. If necessary, we introduce shock diet into the nutritional plan. The shock diet is characterized by specific rules and is intended to stimulate the right direction for patient’s metabolism. We meet regularly, once a week or once every two weeks. 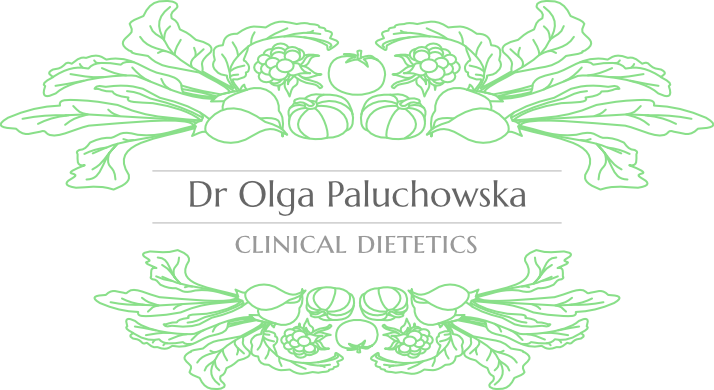 Regular dietetics is run by Dr Olga Paluchowska, together with Daria Sitko–Walczak.